To stream, DaCast needs ports 80, 443 or 1935 open to stream. The service checks first on 1935 when streaming. Most setups should have these ports already opened by default. 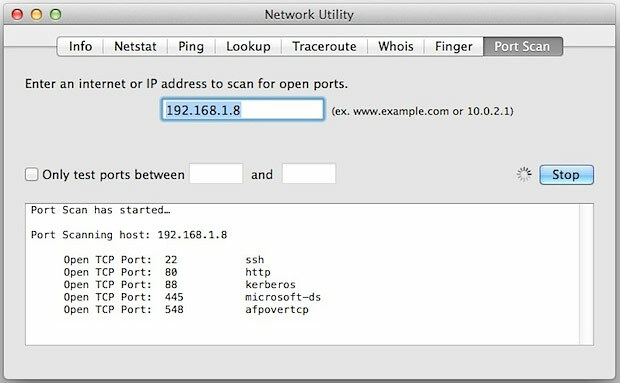 Open Network Utility, located in the Utilities folder in the Applications folder, and click Port Scan. Type your IP address, and then click the Scan button.To find your IP address, choose Apple > System Preferences, click Network, and then select the a network service, such as Ethernet or Wi-Fi. Alternatively, you can try using the “Only test ports between” option to verify the ones DaCast uses. For example you can search on port 80 to 80 to see if that particular port is open. Why do I see a "Sorry, this media is offline" message? Can I do an audio-only live stream?